This weekend I got to go to one of the orphanages that Mercy Ships works with. Besides the hospital-ship, Mercy Ships has many other land-based ministries going on while here in Liberia. Saturday morning I had the privilege to go to a local orphanage and help with the Saturday morning program that Mercy Ship runs. 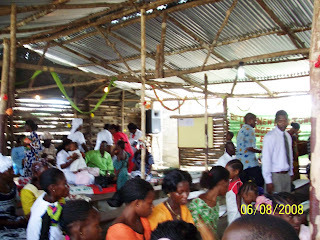 The orphanage also has a school and it is run by a husband and wife from Liberia. As soon as kids see the white land rovers from the road they come running, waving, smiling, laughing. They yell things like, "white people!!!" very excitedly. As soon as you get out of the car you have made friends. Girls and boys latch onto you and want to hold your hand, want you to walk with them, play with them. Brenda who runs the program had many things for us to do while there. We started off with some singing, and then did lots of relay races. It was so fun to watch kids of various ages run while jumping, or run while throwing a ball, or run and skip at the same time. Some of the very young kids had no idea what they were doing, they just knew when they got to the front of the line they were suppose to run! After all the running and games it was time for a bible story and a craft. And after that we got free time with all the kids. During that time I made quick friends with a few of the teenage girls. Korpo, Siannah, and Naomi and I became friends while they played with my hair. I left the orphanage with African style braids and new friends. I loved every minute of being at the orphanage - playing with the kids, giving them attention, playing jump rope and painting their nails. I have to work next Saturday, but the Saturday after that I will be back there - Siannah, Naomi, Korpo and I are counting the days. I wasn't permitted to take pictures at the orphanage, but Brenda took a few general pictures so I will post them as soon as they are available. I also went back to Bethel World Outreach Church this weekend. Once again, I loved every minute of it. At one point I looked around the church and knew this is what heaven must look like. There were people dancing everywhere in their brightly colored and patterned African dress. And again, women were praising God with whistles. Below are a few pictures - from my first visit to the church, that I couldn't seem to post last time. The first picture is of me with the head pastor, Sister Josephine. The next is me and my friend Neil, and the last is a view of the church. The other thing I did this weekend was say good bye to some of my Mercy Ships friends. My friend Neil from Southern Indiana left today, as well as my bunk-mate, Rhea from Connecticut. So, this is what it feels like to be constantly making new friends only to have them leave. Below is a not-so-flattering picture of myself and Rhea. 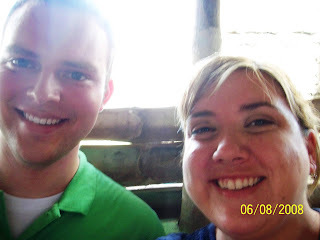 We were on the Bong Mine train speeding through the African countryside. All in all I have had a great weekend. The only thing that makes me sad about it is the realization that I only have 2 more full weekends here. I cannot believe how time is flying by and I cannot fathom how I will ever return to my life as I knew it. Jen...it is good that SKO convinced you to keep your hair long. Who knew it would be so you could have African braids!!! Did you take pics of yourself with htose in? That would be fun to see!! Perhaps when youa re home. Miss you like crazy!! Jen - So good to read your blog and catch a ride on the wave of mercy :) You've done an incredible job of putting into words an absolutely indescribable experience. Thank you for sharing your heart with us. I think Deedee said it best when she was talking to one of our SA teams - she said, after you go, you'll never see Jesus the same again. And so, in a very real way, your life will never be the same again. But what a promise God has made us - that living in His will means something so much better than we could ever imagine. Thank you for living that out - and bringing us along for the ride. May God bless you these last few weeks. We miss you! 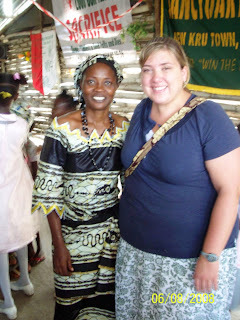 Jen, Are there new things that we can be praying for as you wrap up your last few weeks in LIberia? ?